Tom McGlynn is an American contemporary artist born in 1958. 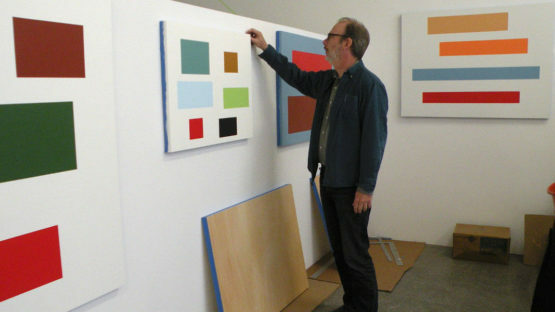 He is known for his minimalist approach to abstraction and for using monochromatic, contrasting colors. Expressing himself through painting, drawing, photography and sculpture, McGlynn also works as a curator, and is a regular contributing writer to The Brooklyn Rail. He received his BFA in Printmaking from Ramapo College in New Jersey in 1979, and his MFA in Painting from Hunter College, City University of New York, in 1996. McGlynn is working as a Professor at the Parsons School of Design in New York City. At first look, his pieces seem to be very precise, but a closer look exposes intended imperfection, and clear signs of brush strokes. As he is inspired by consciousness and the ways of its revelation through human experience, the imperfections seem adequate. The artist has restricted himself to color choice that seems reticent, as he uses colors like blue, red, orange, green, yellow, etc. Far from stability and uniformity, the colors are contradicting and unpredictable. All of his pieces leave the viewers a possibility of different interpretations. That is the key point, as all people, along with their consciousness and unconsciousness are quite different, and we don’t look equally on the same experiences and memories. His artworks are a part of several public collections, e.g. the Whitney Museum of American Art, New York, NY; Museum of Modern Art, New York, NY; Smithsonian, Cooper-Hewitt, National Design Museum, New York, NY; Jersey City Museum, Jersey City, NJ, and many more. McGlynn’s work has also been acquired by the V&A Museum in London, the world’s largest museum of decorative arts and design. He is represented by IdeelArt Gallery in London, UK. Tom McGlynn lives and works in the NYC area. Featured image courtesy of IdeelArt Gallery. All images Copyrighted © Tom McGlynn and IdeelArt.